Financials About To Let Down The Bull Market Again? This 2-pack looks at the XLF/SPX and EUFN/XLF ratios over the past couple of years. The XLF/SPX ratio has created a series of lower highs for the past 12-months after peaking at (1). The EUFN/XLF ratio has created a series of lower highs for the past 18-months after peaking at (2). 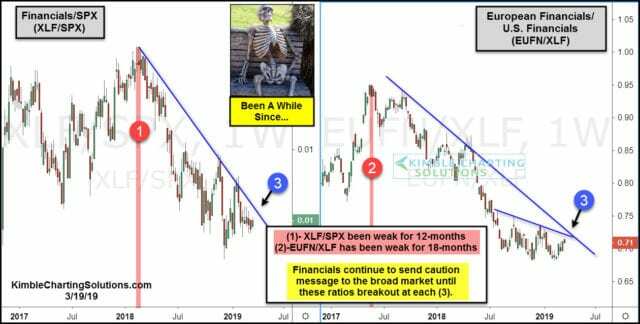 These falling trends look to be sending a negative divergence message to the broad markets if one believes that banks are important for bull markets. Each ratio is near falling resistance at each (3). Stock bulls would receive a positive message from financials if both breakout. Stock bears would receive a positive message if both turn lower at the falling resistance lines. As the S&P, NDX, and Dow are near breakout tests of last years all-time highs, what these ratios do at each (3) will most likely send an important message to stocks in the states and Europe.